The Mission Management Team (MMT) have initially cleared a Micrometeoroid Orbital Debris (MMOD) strike to Endeavour’s window 6 (Pilot’s window), with full re-entry rationale expected. Meanwhile, Shuttle manager John Shannon praised Kennedy Space Center (KSC) engineers for an “unbelievable” vehicle. Impacts from MMOD are a usual – if not undesirable – event during missions, with several recent flights suffering from impacts to the orbiter’s windows on the flight deck. MMOD is the third biggest threat to losing a vehicle during a mission – second only to launch and re-entry. Mitigation of MMOD strikes – such as when docked to the International Space Station (ISS) – and the tracking of space debris, provides some protection for the orbiters, though small strikes are commonplace. Several strikes on the orbiter’s windows have been observed throughout the shuttle program – the last on STS-123 – and at least two MMOD strikes have also been suffered on the radiator panels since Return To Flight. 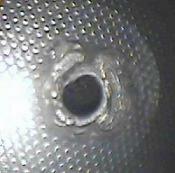 One such strike was later found to be a small slice of circuit board from an expended stage of another launch vehicle, which managed to punch a reasonably large hole through one of Atlantis’ radiators, thankfully missing a Freon-21 coolant plumbing in the panel, which would have caused an emergency to be called, and the immediate order to land. It was previously believed that a similar event occurred on STS-109 in Columbia’s Freon Coolant Loop (FCL1), which restricted the flow of Freon-21 in that loop. However, in a correction from the first publication of this article, the FCL1 orifice was blocked via an internal piece of debris, rather than MMOD. More recently, a MMOD strike was found on Endeavour during the STS-118 mission, again missing a Freon-21 coolant loop. Impacts on the windows are more commonplace – or at least are observed shortly after they impact due to their visibility – with the latest strike spotted by the STS-126 crew, who sent photographs down to the ground for evaluation. In another sign of how NASA extensivily works a problem, the Mission Management Team (MMT) immediately discussed the strike at their morning meeting. “MMOD Window 6 Impact – crew reported 0.5” diameter to the PLT right window to the thermal pane, 1/32” depth,” noted the Mission Evaluation Room (MER) “Funny” report. “No concern for orbit thermal cycles. Dynamic loading on the pane takes into account for the window frame thermal response. Adding a day for the mission does not effect this window,” noted one manager at the MMT, according to MMT minutes on L2. “If you had a problem that you were concerned about what could you do? Different entry designs have different heat loads,” asked MMT chair Leroy Cain. Clarifying the impact is not risking safety, Mr Cain asked for confirmation that the hole would not be risking a LOV/C (Loss Of Vehicle/Crew) during re-entry, which one manager responded that it would have to be a hole through more than just the thermal plane of the window where “we might have to not come home,” which referenced calling LON (Launch On Need) rescue with Discovery. In response to Mr Cain asking about flight history with similar and greater strikes to the windows, the response was noted that similar size has not been an issue, though there was uncertainty in crew measurement, but that on previous missions they have not seen flaw growth for this size of frame. Other orbiter engineering groups and the Crew Office added comments ranging from “there was some sensitivity in the analysis when we talked this at STS-123 case and maybe run this case and see what we have,” to “trying to give heads up and no issue with this defect from orbiter perspective for emergency D/O (Deorbit),” which is typical for an engineering discussion. The initial removal of the impact from a re-entry standpoint will be finalized later this week, with a meeting of the Orbiter Project Office (OPO) on Wednesday, before their findings are sent to the MMT. Backing up the opening thought process on the window damage has been an associated presentation – acquired by L2 – that also shows the damage should be ok to re-enter with, even if the window does crack during re-entry. “STS-126 crew reported a micrometeoroid orbit debris (MMOD) impact on thermal window 6,” opened the presentation. “Estimated diameter of defect is 0.5” (Measurements on orbit are not accurate through three pane system). “10:1 is on the conservative end of the scale and was chosen to estimate the depth of MMOD based on a reported diameter. Estimated depth is used in a fracture mechanics assessment for margin generation. It is not absolute, but provides an appropriately conservative estimate of glass strength when combined with typical fracture mechanics methods applied to glass. As with all evaluation presentations, the worst case scenario is shown. For the case of an orbiter window, even far worse damage can be sustained by the three panel window system, and even then the window would not blow out. 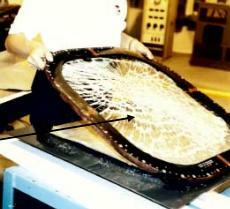 “Window Failure Mode: A ding in the glass will fail by propagating cracks outward from the ding. Low pressure/stress loads that cause propagation result in a less dense cracking system,” added the presentation. “High pressure/stress loads result in dense cracking systems. “From experience (proof testing of a window in a frame), the failed pieces will not be released from the window frame, even with a dense cracking system (high stress/pressure) failure. Proof test failure occurred at approximately 7-8 psi (delta pressure). Other bases were covered, such as via “trajectory consistent load cases”, which also backed up the forward plan to give acceptance rationale to re-enter without any concern over the window failing. “Acceptance Rationale: The highest potential for window failure will occur at peak descent loads Mach 0.70 (past peak heating; in excess of Mach 8.0). Delta pressure across the pane is 2.04 psid,” added the presentation. 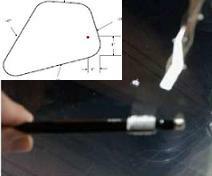 “At this low pressure, flaw propagation may manifest itself in the form of cracks radiating out from the defect site. “Based on previous testing, if a crack should occur, it is highly likely the windowpane will remain intact and retained, and peripheral view across the window will not be detrimentally affected. While all issues gain such wide-ranging discussion, this particular MMOD strike has proven to be one of only a few issues with Endeavour as she heads towards undocking on Friday. With no TPS (Thermal Protection System) issues, and only a couple of minor engineering notes being listed by MER, Shuttle manager John Shannon noted his pride with the engineering team that processed Endeavour at the Kennedy Space Center (KSC), a team tasked with five launches in 2009. “The Cape has put together an unbelievable vehicle. We are able to concentrate on the mission and supporting the ISS team. Entire organization is really pulling together, and you can see over the next year we will have a string of really good flights,” noted Mr Shannon on the latest Shuttle Standup/Integration report.